The following Groundtrax products will require the installation of a suitable sub-base: CellPave 38, CellPave 40, CellPave 50, BodPave 85, CellPave 65 and CellPave HD. The sub-base layer is the main load bearing element in the system and is designed to spread the load of the cellular paving grids and any traffic thereon to the sub-grade below. A well-constructed sub-base will aid drainage and prevent settlement. A sub-base works by distributing a point load over a larger area. The interlock between adjacent particles of the sub-base material greatly improves the ability of the ground to carry heavier loads. A Type 1 sub-base material would normally be unsuitable due to the high fines content leading to minimal porosity and permeability. If this material is to be used, adequate sub-surface drainage must be provided. Use of a Type 1x, Type 4/40 or Type 3 sub-base is suggested where a SUDS (Sustainable Drainage System) is to be installed. Type 3 is the most commonly used product (see note 2). If a grassed finish is required to any of the grid systems, please contact us for advice regarding bedding and infill materials. 1. After removal of the existing top soil layer and leveling of the surface, a Geotrax TS1000 Geotextile should be rolled out over the existing sub –grade layer. This will provide additional strength to the construction and prevent intermingling of the different layers. 2. A GeoTrax GX geogrid layer should now be installed. 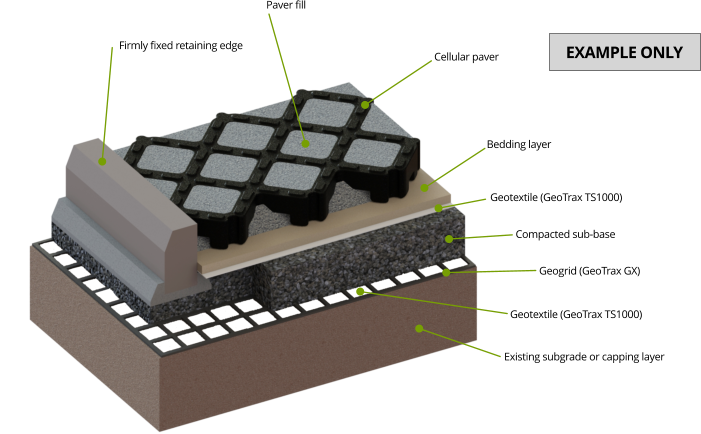 The geogrid layer can help reduce costs by mechanically stabilizing granular materials very efficiently. This product will extend the service life of the system and also helps to control differential settlement. When compacted over the geogrid, the granular particles project through the grids apertures and are mechanically confined. This interlock, combined with the grid’s near-uniform 360 degrees stiffness creates an efficient stiff composite layer. If a geogrid is not used, the total granular sub-base layer thickness must be increased by minimum 50%. The use of the geogrid will therefore greatly reduce the aggregate costs. If construction axle loads are to be greater than 6 tonne (approx. 60kn) the minimum sub-base thickness will be 150mm when used in conjunction with the GeoTrax GX geogrid. The stone size should ideally not exceed 60mm as it will not effectively interlock with the geogrid. 3. 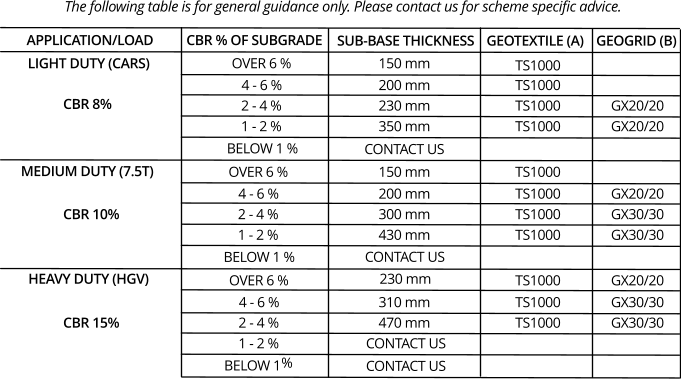 Sub-base layer – depth according to the following guidelines. (A) 2 layers of Geotextile will be required – layer 1 above the sub-grade and layer 2 above the sub-base. Allow an additional 10% total area to allow for overlaps. (B) Allow an additional 10% total area to allow for overlaps. 4. A second Geotrax TS1000 Geotextile layer should now be installed. This layer adds additional strength to the system and prevents the sub base and bedding layers mixing. 5. Bedding layer. Varies depending on product – CellPave 40 and BodPave 85 will require a 5 to 20mm free draining angular gravel to a depth of around 40mm. This layer should be smooth and level to allow an even surface for laying the pavers onto. A light compaction with a whacker plate is usually sufficient. Do not over compact as these grids both have ground spikes that need to be installed into the bedding layer itself. CellPave 38, CellPave 50, CellPave 65 and CellPave HD have a flat underside and should be bedded onto a level, well compacted layer of clean sharp sand to a maximum depth of 20mm. 7. Fill layer of 5mm to 20mm sharp angular gravel. The angular gravels will fill the voids providing a secure, stable finish. A light compaction with a vibratory plate is also recommended to ensure even fill within the cells. It may be necessary to top up to ensure complete fill of the cells. Rounded or single sized gravels should not be used as they will not interlock or carry loadings as well and will also be prone to washing out during heavy rain. 1. The CBR (California Bearing Ratio,) is a measurement of subgrade soil strength. Please contact us for specific advice on soil CBR% strength, ground conditions, capping-layers & construction over weak ground with a CBR less than 1%. For larger schemes, we are able to offer a design service. We will need to know the existing CBR and the proposed vehicle usage on the area. Our engineers will then specify the appropriate geotextile, geogrid and sub base depths to be installed. 2. Type 3 Sub-base. Pure crushed granite, limestone or clean crushed concrete. A 40mm product that has been screened to create a reduced fines aggregate. This product is fully certified according to the Specification for Highway Works. This is the most widely used sub-base where less fines are required. MOT Type 3 also known as DOT Type 3 after the Department of Transport (DOT) specification for granular sub-base material and is also the most widely used approved sub-base where SUDS (Sustainable Urban Drainage Systems) when constructing permeable surfaces. In order for a product to be classed as ‘Type 3’ quality it must comply with the Department of Transport Specification for Highway Works, clause 805 (SHW 805).